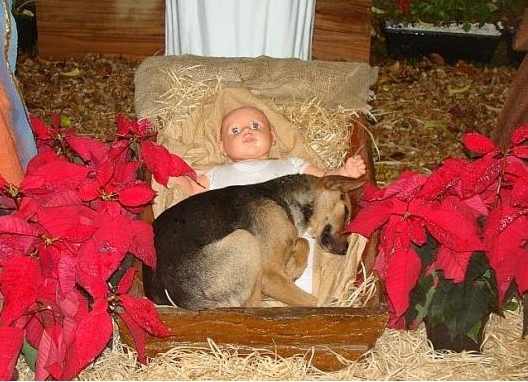 A nativity scene was erected in a church yard. During the night some folks came across this scene. An abandoned dog was looking for a comfortable, protected place to sleep. He chose the manger of baby Jesus. No one had the heart to send him away so he was there all night. We should all have the good sense of this dog and curl up in Jesus' lap from time to time. Homeless dog wandering the streets? This was either in New York City or Moscow - not much difference these days. I hope that baby finds a good home. What a beautiful pup. I sure hope he finds a home soon. Hope fully some one took this as a sign the Jesus wanted this dog to have a home! I hope someone took him to a loving home, tis the season for love and compassion! Someone once called dogs "4-legged angels." I couldn't agree more. Often, they are everything people are not: Loyal, loving, obedient, grateful, happy and devoted. Sure, there are dogs who have problems, but those problems can almost always be traced back to their owners. A really good dog-trainer knows ANY dog can be rehabilitated, but it's PEOPLE who are so darn stubborn and reluctant to change their ways. We could all learn many lessons from our canine friends! Please let us know the rest of the story...please let us know if this precious angel finds a good home. I have no way of finding out the rest of the story. This was forwarded to me by a reader and was probably circulating around the internet. We'll just have to trust in peoples' goodness and hope the dog found a home.